First, stop distractions and make your mind clearer and more lucid. Choose a quiet place to sit in a comfortable position. You can sit in the traditional cross-legged posture or in any other comfortable position. You can even sit in a chair. Keep your back straight and this will prevent your mind from becoming sleepy. Sit with your eyes partially closed and turn your attention to breathing. Breathe naturally, through the nose. Become aware of the sensation of the breath as it enters and exits the lungs and nose. Try to concentrate on that sensation to the exclusion of everything else. Your mind may be very busy. You may even feel that the meditation is making it busier. Remember, you are simply becoming more aware of how busy your mind usually is. Resist the temptation to follow different thoughts as they appear. Remain focused only upon the sensation of breathing. When your mind wanders, immediately return it to breathing. Repeat this cycle as many times as needed until you have settled on breathing. If you are patient, your distracting thoughts will subside. You will experience inner peace and relaxation. Your mind will feel lucid and spacious. You will feel refreshed. You will likely stay with this state of mental calm for a while. 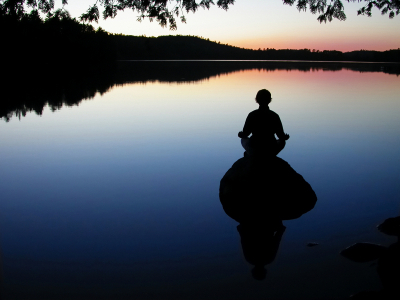 Although breathing meditation is only a beginning stage of meditation, it can be powerful. You will be excited to experience inner peace and contentment just by controlling your mind. You will learn that you don’t have to depend upon external conditions or medications. Much of our ill health is caused by stress. Ten or fifteen minutes of breathing meditation each day will reduce this stress. You will be better equipped to deal with difficult situations. You will feel warm towards other people. Your relationships and general health will improve.